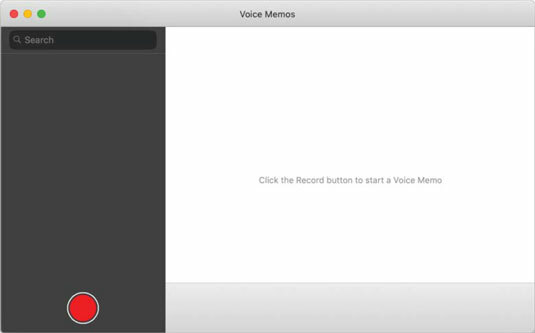 Voice Memos is a new addition from iOS to macOS Mojave; it’s a simple one-trick-pony of an app that lets you record, play back, and share short audio recordings. 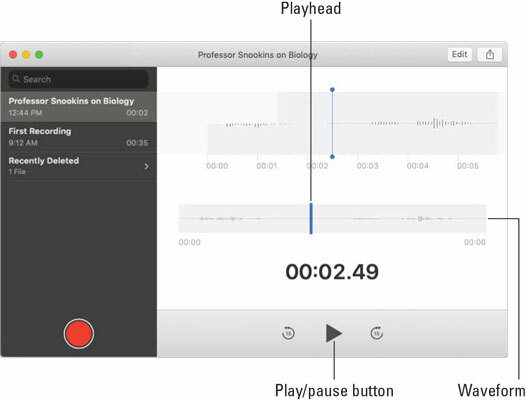 Consider all the times you’d find it useful to have an audio recorder in your MacBook — perhaps when you’re attending a lecture or interviewing an important source (a big deal for writers). Or maybe you just want to record a quick reminder (“Pick up milk after work”). Well, you’re in luck. Mojave now includes the same built-in digital voice recorder you know and love on your iPhone (and other iDevices). Launch Voice Memos, and you’ll see the simple window displayed here. Click the red button to begin recording. Recordings use your Mac’s built-in microphone by default. If you prefer to use a different microphone, select it in the Sound System Preferences pane’s Input tab before you begin recording. Click the big red button to start a recording. 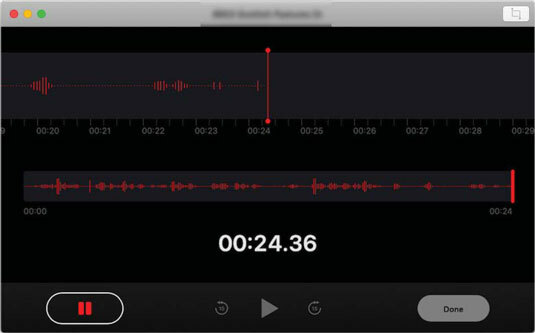 The waveform that moves across the screen as Voice Memo detects sounds helps you gauge the recording level. You can pause a recording by clicking the red pause button, and then click it again to resume recording. A timer on the screen indicates the length of your recording session (24.36 in the figure). A timer indicates the length of your recording session. Click Done when you’re finished to save the recording. It’s that easy. To adjust the recording level, visit the Sound System Preferences pane’s Input tab and adjust the Input Volume slider. After you capture your thoughts or musings, you’ll probably want to play them back. To do so, just click the voice memo you want to hear (Second Recording in the figure), and then click the triangular Play button to listen. Click the voice memo you want to play, and then click the Play/Pause button. You can drag the playhead (the vertical blue line in the middle of the waveform) to move forward or back in the memo. Click any Voice Memo in the sidebar. Click the name Apple assigned (New Recording 1, New Recording 2, and so on). Type your own name for the voice memo. Professor Snookins on Biology, for example. That’s it. Your recording is duly identified. Maybe the professor you were recording rambled on and on. Fortunately, it’s easy to trim the audio. To do so, first click a recording and then click the Edit button in the upper-left corner of the window. Now, click the trim icon (labeled in the figure) and drag the start and end markers to determine the portion of the audio you want to keep. Drag the start and end markers to trim the recording. To conclude the process, click the trim icon — but before you do, I recommend that you preview your edit by clicking the Play button. If you’re happy, click the trim icon. If you make a mistake, choose Edit → Undo immediately to restore the audio you trimmed. You may want to share a Voice Memo with others. No problem. Just click a Voice Memo to select it, and then click the share icon. You then have the option to email the memo or send it in a message. Or you can share it instantly with Mac or iDevice users via AirDrop, or add it to the Notes app. Here’s another cool trick you can do with a recording. Email the recording to yourself, download it onto your Mac, change its extension to .m4r, and then add the recording to iTunes. Presto, you’ve added a ringtone. 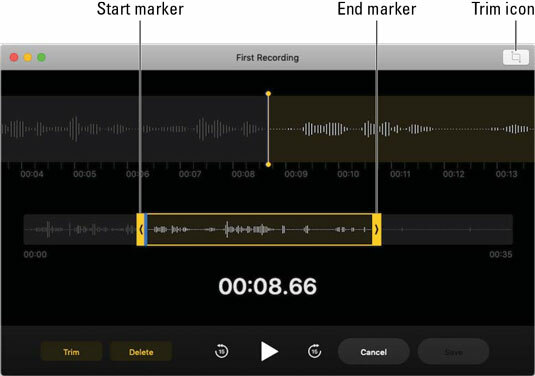 When you have no further use for a recording, you can remove it from the Voice Memos app by selecting it and pressing Delete (or Backspace).